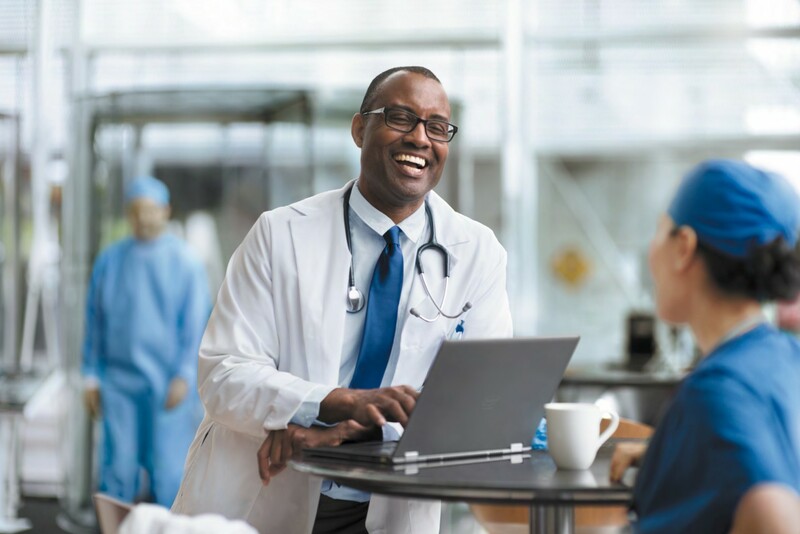 Clinical and claims data captured at clinics, hospitals, pharmacies and insurers including diagnosis codes, prescriptions, program notes, claims, vital signs, test results, etc. Diagnostic data captured by medical devices and imaging equipment. 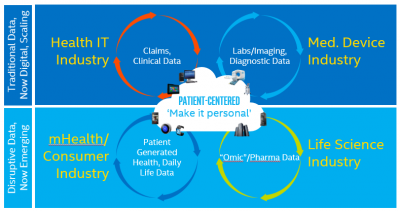 Consumer-generated health data captured outside the traditional health system and including patient diaries, observations of daily living, vital sign monitors, fitness wearables, online and smartphone apps, social media and gaming, etc. ‘Omics’ – vast amounts of information contained in each person’s genome (and proteome, metabolome, etc.) used to attack disease at its molecular roots – collected at multiple sites, across time, and in structured and unstructured formats. 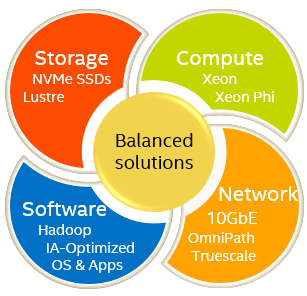 Using data from these multiple sources effectively will be best achieved with a balanced architecture: modernized compute, storage, network, and optimized software are critical to optimizing performance, capacity, and cost. First, consider whether the workload is appropriate for scale up or scale out. Scale out workloads typically utilize parallel processing, where Intel Xeon E5, and also potentially Xeon Phi Co-processors do the best job. Big data repositories are a key area of value, enabling analytics to both improve clinical operations and enhance research. In addition to processing, Hadoop software and high bandwidth, low latency network adapters are key elements. Other workloads require a scale-up approach and the Xeon E7 Family of processors: enterprise systems like EPIC and SAP, OLTP databases, analytics and virtualization – Intel has worked with leading software providers in each of these areas to optimize execution on Intel architecture. High core count, large memory capacity, and new TSX technology where threads can share memory are all needed. And beyond the processor, consider SSD storage and low-latency networking to yield best overall results. Not to forget, optimized Operating Systems also play a large role. For example, Intel has teamed up with Red Hat to optimize RHEL on Xeon. A whole list of key features enable world class performance - scalability, security, serviceability, reliability, availability, power optimization, and storage and network enabling with systems running Red Hat Enterprise Linux 7. EPIC customers, for example, can see tremendous savings and scalability improvements (over ~8M GREFs!) by running their Cache DB tier on the latest Xeon E7 V4 systems. We’ve created a Total Cost of Ownership tool which you can use with your Red Hat or OEM rep to evaluate your specific environment utilizing Epic configuration guides. We will be hosting a Webinar in June on Red Hat and Epic, details will soon be available. So as you address healthcare data convergence, remember that an architecturally balanced solution with the right components for the task will help you take best advantage of your computing dollar.